NFL players from every team will visit Radio Row during the course of Super Bowl week to do interviews. But for one current and one former Titan taking part in the NFL’s Broadcasting Bootcamp at Super Bowl 53 could be the start of a new career. ATLANTA (WTVF) — NFL players from every team will visit Radio Row during the course of Super Bowl week to do interviews. But for one current and one former Titan taking part in the NFL’s Broadcasting Bootcamp at Super Bowl 53 could be the start of a new career. 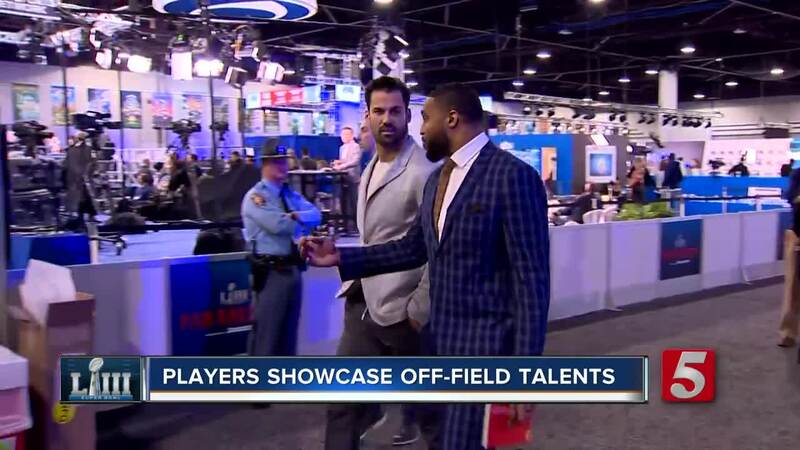 Woodyard and former receiver Eric Decker are serving as analysts on tv and radio shows throughout the week, getting a look at the job the media does. “Its a good way to introduce (yourself) and network with people,” said Decker, who played his final season with the Titans in 2017. Woodyard and Decker know their stuff, but admit being in the media isn’t as easy as it looks. “You think, ‘oh, this can’t be that hard,’ but when you’re interviewing someone or when you’re calling a game, it’s intimidating,” said Decker. Besides a great learning experience, the players say the week has been fun. A potential jump start to a career after football. Whenever they get the call to join the broadcasting force full time - you can bet both Woodyard and Decker will have plenty to say.